ITIL 2011 Foundation Exam Live Lessons is live! « Knapp I.T. 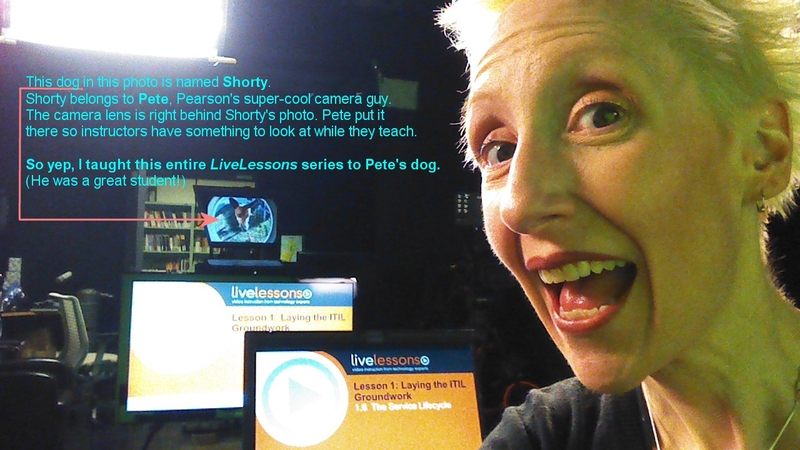 ← The LiveLessons downloadables are up! ITIL 2011 Foundation Exam Live Lessons is live! Yaaaaay! I’m so excited! As of August 6th 2015, my latest exam prep product ITIL 2011 Foundation Exam LiveLessons is available now via Pearson IT Certification and also over at Safari Books Online. I had a BLAST recording these videos this past April at Pearson’s gorgeous studio in San Francisco. I got to work with Pete Vilotti (Pearson’s waycool camera guy) in the studio that week, and I even got to meet his equally-cool wife, Christie. My beau Matt came with me to San Francisco, and the four of us even hung out one night after work, too. So not only was it a successful work week, we made some super-cool new friends. You can’t beat that. The downloadables (get them here) have been available since October and have been getting rave reviews. Here are just a few. I really enjoyed your videos but taking so many screenshots was too much. I purchased your workbook and it saved me so much time, but also provided so much more information and I have a much clearer picture. Thanks to you! –Rohit P.
Thank you for making that 6page exam-cram guide. It is worth every penny like you said!!!! I passed my exam with a 90% thanks to you! — Steve D.
19 comments to ITIL 2011 Foundation Exam Live Lessons is live! 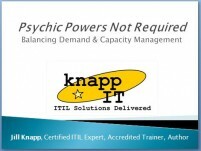 Awesome ITIL 2011 Foundation Exam training video. I’m watching it on Safari Books Online. You mention we could download slides here at your site but I do not see where. Could you point me in the right direction? Right now the only downloadables I have available there is a sample exam with its answer key. The rest of the materials are ready to go on my end, but I’m waiting on the last of the paperwork from the ITIL Powers That Be to go through which will give me permission to post them. It’s taking forever because everyone seems to be on vacation! As soon as the additional items are approved to be posted online (I’ll have a 6-page exam-cram study guide available, and a 400+ page workbook too with all of the video’s slides and tons of notes), they’ll be on that page. That’s sounds great. I’ll check back again. I don’t normally comment on websites but I just had to take a moment to tell you that your ITIL 2011 Foundation LiveLessons was absolutely fantastic! I watched your video concurrently with another on-line training class that I am taking and was so grateful for YOUR approach to ITIL! It has really inspired me and I just wanted to congratulate you on an awesome production. Looking forward to the downloadables! Thank you so, so much! I’m thrilled you like it! I was just bellyaching to my mom last night that I was bummed this new video series isn’t on Amazon because I have no way of reading feedback– I have no idea if people like it. But ta-daaa, your comment appeared this morning, and just made my day. Thank you! I’m reeeeeaaaaally hoping to get those downloadables up this weekend. It’s killing me that they’re not there yet. Soon! Thanks for the slow step by step course. I love it. I am actually totally blind, so the audio is all I have to go by. Normally, I don’t make a big deal out of that, it’s just who I am. However, I thought I would let you know that your descriptions and verbocity regarding the slides you are talking about have allowed me to follow everything very clearly. I have only made it through a few of the lessons as of this writing but I really do hope you keep mentioning when that red pencil shows up on a slide so I can make a note in my notes. Oh, and, thanks for slowing the material down because this is a pretty steep learning curve for me. Ironically enough, I usually read books at a speed of about 440WPM with my speech synthesizer, but I need a human voice to get me going on this ITIL path, so thanks. I’m confident I made a big deal out of those red pencils on all of the slides, so you should be in good shape. And soon I’ll have an exam-cram sheet available for download, and that will summarize all of the “red-pencil points” in one place for you. If I can clarify anything for you, please don’t hesitate to ask, OK? Hi, I have purchased your live lesson for ITIL, but was disappointed not to find the downloadable presentation, notes etc. Do you know when they will be available. I’m disappointed, too. The downloadables are ready to go, but I’m not allowed to post them until I get two remaining contracts signed. (This all has to do with licensing ITIL’s intellectual property. I’m sure you’ve seen some of the videos have a copyright statement on the bottom of the slides. The license for *showing* slides is different than the license for printed matter… and my downloadables will be “printable,” so we’re in contract-language limbo while we work out which license governs the downloadables and then who will pay for the licensing.) The hold-up isn’t on my end and it’s making me CRAZY. Right now there is a sample exam with an answer key available on that page (for free, even! ), and another free sample exam will be posted likely late this afternoon (Friday, Oct 9th). But the big workbook and the 6-page “exam-cram study guide” are the ones we’re struggling with. This video series was never intended to have any printed material offered; my publisher wanted it to be “videos only.” When I explained that there’s a lot of material to learn and having something printed would help, the publisher assumed people would take screen shots and study from those. So I did create the series so you have everything you need to be successful in the videos as they are… the workbook was just going to do that “screen-shotting” for you. Sit tight, and thank you so much for your patience. And most of all, thank you for purchasing my video series; I hope you’re learning from it! I would like to comment that the video series was much better than the ITIL V3 Series as these had your face and expressions that made it all interesting. I was using the ITIL V3 series on safari before I noticed the new addition and I found that more engaging and would like to appreciate the extra effort you put in the new series for some of us that series of power points tends to make us sleep. I am scheduling my exam soon for November and was wondering if there is anyluck having the downloadables sooner before then so I can have an extra shoulder to climb on when I face the giant. Thanks once again for the effort. ITIL LiveLessons downloads will (hopefully) launch this weekend! Sorry it’s taken so long; it’s been completely out of my control. We’ve been having trouble setting up the store that people will use to purchase the workbooks. We’re hoping to have it hacked out tomorrow for a launch this weekend. I get emails and tweets every day about it, and I’m thrilled people want them! You are really so amazing, this is the best course I have attended ever. May be this is the first time that I bought something which worth more than it cost. I can’t explain how wonderful your way in transferring knowledge, I know it is not an easy job, thank you very much. Bye and Wish you all the best. Thank you so much for your kind words; I truly appreciate it! There’s no place online for people to write reviews of the product, so I’m never sure how people are liking it unless they write… so thank you! I’ve got good news: The downloads have been available for a while now, so go check ’em out! Some are free, and some cost a few bucks, so hopefully you’ll find something that will help you out. I saw the training video it was amazing. I passed the exam and I got 97%. The way that you pass the idea is fantastic :) and reflect the actual experience that you have.simply, you are aware of what you are saying. I really enjoyed your live lessons on the foundation course. You’re a great presenter and engaging which is truly a challenge with a topic that, in lesser hands, could be a very dry topic. I watched your videos while painting my kitchen, took the practice exams and was able to pass the test with flying colors. Do you offer something similar for Intermediate ? Thank you so much for your kind words, and WHOA! Congratulations on a fabulous score! You really knocked it out of the park! I had a good time making the videos, and it makes me so happy that my videos were helpful for you. Best of luck as you continue your ITIL journey! Aw, thanks a bunch for your kudos re: my videos. It makes me super-happy to know they worked for you and that it didn’t put you to sleep in 20 minutes like some other video series can. You’re right; ITIL can be pretty dry stuff. Congrats on passing the test! Woot woot! I would just like to state that having followed your ITIL 2011 Foundation Exam Lessons on Safari Books online. I took the exam at the beginning of April this year and passed with 78%. Your down to earth explanations helped me to understand ITIL speak. I am now studying for a Software Asset Management certification which is only made possible by your great teaching skills. Congratulations, Mark! That’s a good score, especially considering that the exams have changed and gotten a LOT harder as of January 1 2016! They are now asking some new things that we didn’t even cover in the videos (they’re only covered in the six-page study guide)… so you did an extra-great job! Congrats on your shiny-new cert and thank you for your kind words! GREAT job! !